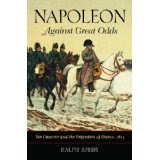 Last week I finished Napoleon against great odds : the emperor and the defenders of France, 1814 / Ralph Ashby. This book is interested in the preparation for the campaign rather than the campaign itself. 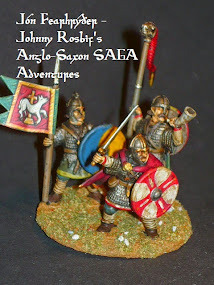 Although it has a chapter on the battles and describes the linear progression of the campaign, it's more interested in the preparations or the lack thereof prior to the battles. The author analyzes the figure of '900,000 men' that Napoleon thought he could raise, and with reasoned argument points out that that number was never a reasonable figure, and even if he could have raised that number, only a fraction could have been armed, clothed and trained in time to meet the Allies' invasion. As it was, the manpower raised was not able to be effectively used with depots still full of untrained recruits and cavalry and artillery units without horses. The author also explains how the emperor was caught in a catch-22 situation where draft-dodgers and deserters could not be rounded up, because the gendarme and National Guard units dedicated to this task had been gutted to make up the numbers on the front line; ie. in order to maximize his recruitment for the front line, he needed to have men dedicated to serve in the rear areas, but because he lacked front line troops, he couldn't spare any for the rear areas! It also examines the motives of the average recruit and so doing kills the sacred cow of 'war-weariness' as a major factor in explaining the French defeat. The author proves that draft-evasion and desertion once in the ranks were not especially different to any other year. Admittedly, these were on the increase as a general trend over the preceding decade, but there was no huge increase as one would expect where deserting into the community would be so much easier than previously. On the contrary, soldiers could be seen to be defending their homeland, and especially their capital. National Guard troops particularly fought with determination because a lot of the time they were defending the communities they came from. 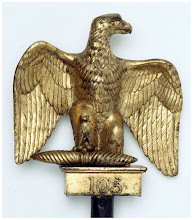 While certainly it could be argued that not many fought to preserve the Bonapartist regime, most troops could be argued to be motivated by the need to protect le patrie. The author also criticizes Napoleon's lack of preparation of the civilian population to resist the invasion. Napoleon feared the leaderless mob, and so belatedly prepared the population for guerrilla warfare. The areas conquered by the vengeful allies were ripe for insurgency, and in fact rose spontaneously against the depredations of the cossacks and Prussians, but Napoleon didn't really do anything concrete to help. Also he criminally neglected the defenses of Paris when it would have been the simplest thing to build earthworks with the available military manpower and civilian volunteer labour. The excuse that he didn't want to alarm the population really doesn't bear close examination and by the time Napoleon decided to order the defenses built, Joseph was so fixated on the supposed financial cost that nothing was done. Napoleon's centralisation of decision making left the bureaucracy paralyzed while he was with the army, and all orders sent were only haphazardly followed through without his firm hand on the reins of government. He was paying the price for surrounding himself with yes-men, who had all independent decision making abilities neutered by working for this imperial one man band. His decision to attack the Schwarzenberg's lines of communication was doomed to failure as the Austrian had suddenly grown a backbone and accepted the wisdom of capturing Paris, so because Napoleon had neglected the city's defences, his defeat was inevitable. All this was sped up by the pusillanimous behaviour of Joseph in bullying the Empress to evacuate and then scuttling off himself, throwing the responsibility completely on Moncey and Marmont. Incidentally, another book on the same subject I read earlier in the year, Napoleon 1814 : the defence of France / Andrew Uffindell, published in 2009, makes the case for Schwarzenberg's tardiness by pointing to geographical, meteorological and agricultural factors; His Army of Bohemia advanced through Champagne in the east of France which even in summer was not the most fertile and productive region, let alone the depths of an unusually bitter winter. In order to feed his army and stop it disintegrating, Uffindell asserts that Schwarzenberg was forced to halt his advance to allow the supply columns to catch up with him. Blucher and his Army of Silesia had the luxury of advancing on a more northerly axis through a relatively more fertile area that could support his rapid marches and subsequent retreats more easily. I enjoy reading these types of books that have original research and aren't just a retreading of the same narrative. I like to have the why and how explained, not just the what described. Thanks for this very perceptive review of my book. It is gratifying to see that someone read the book and fully grasped all the points I was making! For gamers and/or miniature enthusiasts, some of my book info might be useful for ideas about French 1814 units, uniforms, effectiveness (re rules), etc. Thanks again for the very insightful review. You're welcome, Ralph. Thanks for taking the time to make your comments. Great post! I've long had an interest in the 1814 campaign, and will be adding this one to my library.